My grandmother taught me how to cook artichokes when I first got married. Her boiled artichoke recipe is something that I make over and over again. Boiling artichokes couldn’t be EASIER and they taste absolutely delicious. When I go out to a restaurant, I typically opt for the breaded version, but I never make that at home. When I cook for my family, it’s usually much a healthier version. Take a look at this super easy side dish that is filled with flavor and is so much fun to eat. I have a lot of friends who get intimidated by artichokes because they can get a bit messy when you eat them and require a few steps during the prep process. But I PROMISE you, once you start boiling artichokes, you will be doing it with your eyes closed. A quick chop, shove and boil and you are done. Let me explain. The first thing you need is a pot that you can fill with water. As you can see in the video below, I have two pots on my stove. You can use either one of them. You only need to fill your pot with enough water to cover HALF of your artichokes. They will not fall to the bottom of your pot. They are going to float. So, at best, only half of your artichokes will always be under the liquid. And no, you don’t need to flip them halfway. That wouldn’t work anyway. They are bottom heavy. As you are boiling your artichokes, you will notice that the tops will always be above water. What I like to do is take off a few of the bottom leaves. The tiny ones. The ones that really probably don’t have any meat on them anyway! There’s no point in having them on your vegetable ANYWAY. It will be all work for nothing. So, pull off a layer all the way around and then chop off the stem. Chop off the full head of the artichoke with a sharp knife. Each leaf has little sharp things at the edge. You need to do this for your sanity. Then, take your fingers and pull apart all the leaves as best as you can. Just get in there and pull out the leaves away from the center. You want to keep everything intact, but you are about to add some onions and garlic into the mix and you need a place to put it all. Fill a pot halfway with water and set it to boil. Now that you’ve chopped you’ve prepped your artichokes, you need to take your ingredients and mixed them together Using your fingers, stuff what you can into a few places all over each artichoke. If you run out of your mixture and you feel like you need to make more, then make more. Truth be told, I usually eyeball this part. That’s what my grandmother taught me to do and so I don’t really measure anything at this point. If I pull out 5 garlic cloves, then I use 5 garlic cloves. Do what you want. 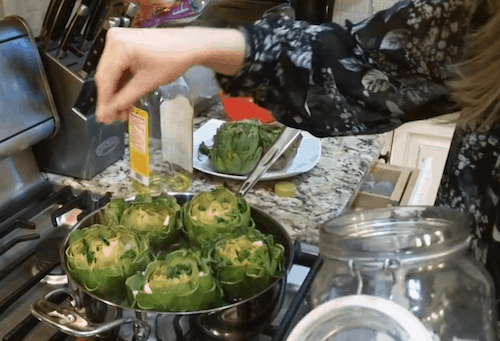 After you’ve stuffed your artichokes, place them in your pot of boiling water. Drizzle olive oil all over the top of each of your artichokes and then cover your pan. Sprinkle with salt and pepper. Lower the heat to medium. Allow the pan to cook for about 40 minutes. Artichokes should slightly change color and open up when done. Serve cold or hot – that’s really up to you. To eat an artichoke, all you have to do is pull off the outer petals one at a time. Pull the leaf through your teeth to remove the soft, pulpy portion of the petal. When you start, the outer petals will only have a tiny bit of “meat”. But as you continue in towards the center of the artichoke, you will find that you start to get more and more yummy goodness. Once you are done with that pulp, you need to discard remaining petal. It looks like you are throwing away a lot of the vegetable, but that’s the way you play this game. The heart is my absolute favorite part of the artichoke. I fight over the heart. I arm wrestle strangers. I with go toe to toe with you. That’s what all this work is all about. First, you need to spoon out the fuzzy center at the base and discard it. I just use my fingers. It gets messy. You could use a fork or a spoon if you want to seem fancy. Whatever. I just dive in with my fingers and I don’t care if I am sitting at a 5-star restaurant – come at me. The bottom, or heart, of the artichoke is entirely edible. I eat it all the way to the bottom of the stem. If the stem has been cooked for 40 minutes in water, then it is good enough to eat and it is going right into my belly. Can You Eat A Raw Artichoke? I mean… I don’t know? Why would you want to do that? Maybe you can. I don’t even want to go online to see if that’s a real thing, because I know what it tastes like and it wouldn’t bring you any joy. I think you should steam it at a bare minimum. Please – try this recipe first. It’s really not that hard. I don’t mean to be rude. Please, don’t take this as me being rude. I am trying to love you here. I am trying to tell you that there is a mouthful of wonderful goodness waiting for you – something that a raw artichoke just cannot provide. What Sauces Can I Dip Artichokes In? What do you think? Something you’d like to try out? Looking for more great recipes to consider? This artichoke recipe looks divine! Looks very easy to do too. I have to ask where you find artichokes that you don’t have to wash first. Ones I have ever bought had to be washed inside and out because there was a lot of dirt visible in and out. My husband would have loved this recipe. He used to make stuffed artichokes, and you are right, lots of calories. This is very similar to ones that my grandmother and mom always made. To make them even better, chop up little pieces of Parmesan or Romano cheese and place them amongst the leaves along with the parsley and garlic. I also peel the stems and add them to the water. They’re great, once they’re tender. After eating all the leaves, don’t forget to use a spoon and eat the most succulent part, which is the heart. Just remove the “hairy” part first! I place JUMBO artichokes in my pressure cooker, drizzle with lemon juice add 2 cups water. I like to steam mine on the stove. I put a bay leaf in the water for flavor, place artichokes over a steam rack, drizzle with olive oil, cover and cook on med heat for one hour. I serve them with aioli sauce or melted garlic butter.